A young girl travels with her mother to a remote military base in the Spanish countryside to live with her stepfather, an army captain . While there, she meets a magical faun who gives her three fantastic quests to carry out. This would be complicated enough, but in the meantime it is 1944 and the Spanish civil war rages on, the fort that they are staying at is full of intrigue, the girl's mother pregnancy is not going well, and her new stepfather is a sadistic fascist. Pan's Labyrinth is the type of magic realism that is not often seen in movies. I guess it resembles older films like The Wizard of Oz and Labyrinth in some ways, but Pan's Labyrinth is a much darker tale despite featuring such a young protagonist. The film is also unusual in that the story focuses more on the events in the real world, while the fantasy elements exist more as a subplot. In fact, you could edit out the fantasy scenes altogether and still have a complete story. The deliberate contrast between the sinister creatures the girl must encounter in her quest with the more mundane human monsters she must live with is well done. This is not a story for young children - the film earns its R16 certification with several gory scenes. 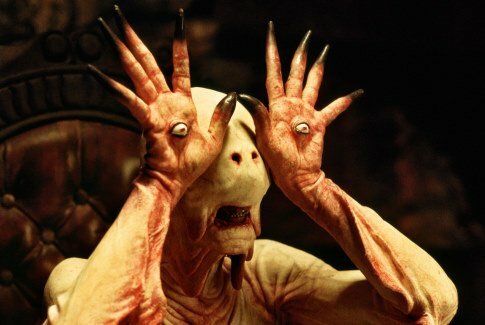 Pan's Labyrinth is one of the better films I have seen all year; highly recommended!